Random House, NY, 1998. 1st edition. Hardcover. Fine/Fine . 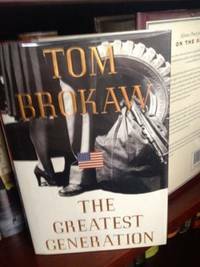 "To this generation that gave so much and asked so little, Brokaw offers eloquent tribute in true stories of everyday heroes in extraordinary times. From military heroes to community leaders to ordinary citizens, he profiles men and women who served their country with valor, then came home and transformed it: [Pub. Info] The book is in Fine/ As New condition.1ST EDITION.